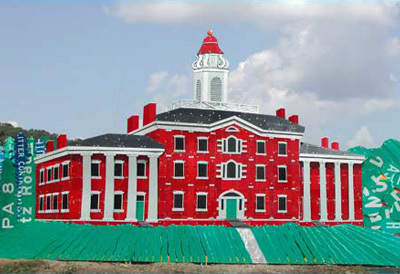 This is a replica of Allegheny College's Bentley Hall. I originally drew this on a 8 1/2 by 11" sheet of graph paper and then enlarged it to 10' by 15'. The roof even slants back at a fourty-five degree angle. This structure was a major portion of my responsibilioty for the second summer of my internship. For a view of the entire fence project check out our gallery located in the "process" section below. During my undergraduate education at Allegheny College, I had the opportunity work with a group of fellow artists on the "Read between the Signs" project. This internship was a joint project between the College and the Pennsylvania Department of Transportation ( PENNDOT ). This project involved turning old aluminum road signs into a fence mural that surrounds the perimeter of the PENNdot building in Meadville, PA. The mural would paint a picture of the town's cultural and historical story, while transforming the chain-link fence housing the road equipment a more aesthetically pleasing site for visitors. I applied and was granted this internship for two consecutive summers. During this time I learned what working with other artists on a single goal entailed and also numerous fabrication skills. The original idea was derived by environmental scientists at Allegheny College, as a greening the gateway for Meadville. Meadville has a long history in many regards. Apparently this small rural town used to be a resting point for people traveling between New York and Chicago. The town is noted for the invention of both the zipper and the channel lock pliers. I have had the privilege of working on the sign fence project for two summers. It allowed me to not only branch my art skills to a new realm, but also experience the joy of working collaboratively with other artists. During my first year I worked alongside fellow artist Julie to construct three-dimensional hot air balloons for the fence mural. The second summer as an intern, I had the task of constructing a huge Penn DOT road construction vehicle for the fence and Allegheny College's Bentley Hall. After my second term as an intern concluded, I was asked by the project director to create a three point perspective snowplow for the project by myself. I accepted this task and had the luxury of getting to make art for another two weeks past my internship. During the process of constructing the snowplow, I though it would be neat to document the process through photography. I have described the process in a condensed fashion to give a brief overview, but I would refer any interested viewer's to the public art section of my website for a more elaborate description of the process.